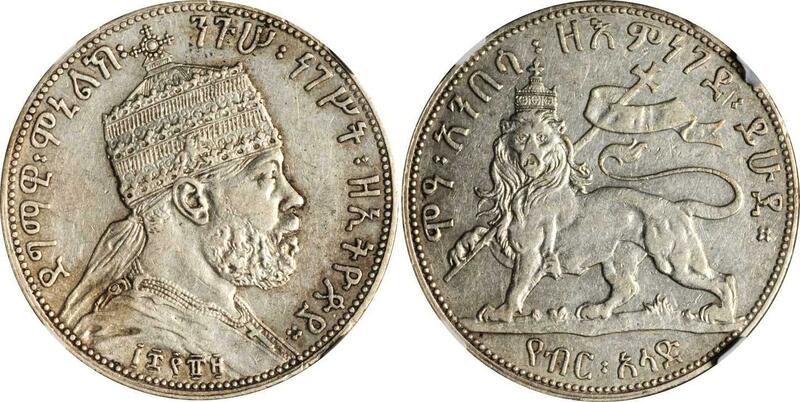 Obverse: Crowned bust of Emperor Manelik II right. Date (1889 of the Eastern Calendar) below. Ethiopian legend around. Reverse: Crowned lion left, holding cross-topped banner with&nbsp; left foreleg. Ethiopian legend around. 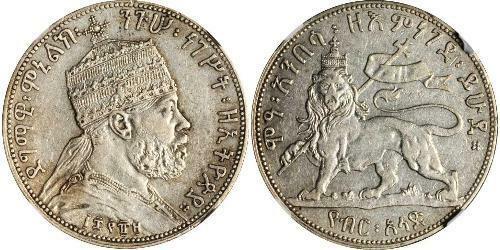 The birr is the unit of currency in Ethiopia. Before 1976, dollar was the official English translation of birr. Today, it is officially birr in English as well. 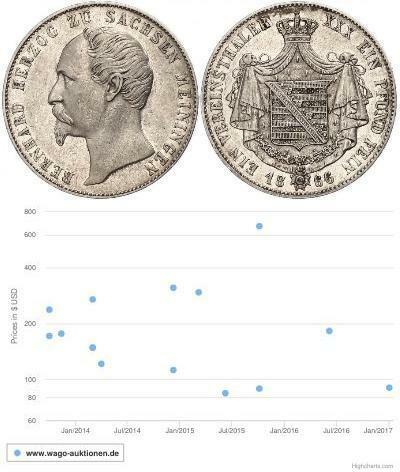 The currency was first intruduced in 1893 and was equivalent to the Levant Tallero or Maria Theresa thaler, which were the official currency beneath item money called amoleh (blocks of salt). 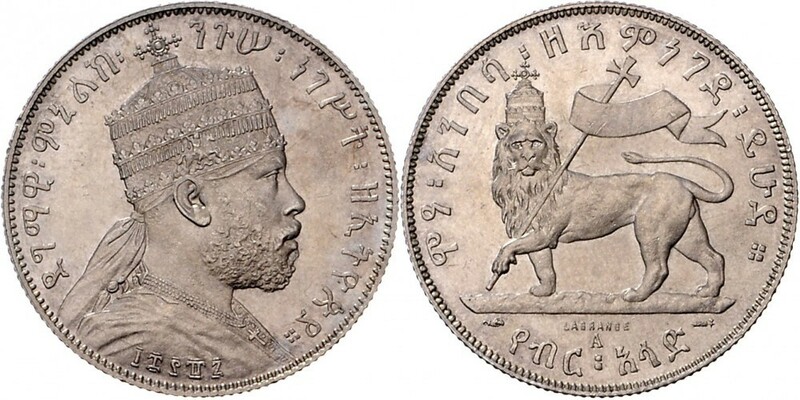 The only modern machine struck Ethiopian crown to actually circulate. All were struck at Paris. Emperor Menelik II GCB, GCMG, baptized as Sahle Maryam (August 17, 1844 – December 12, 1913), was Negus of Shewa (1866-1889), then n?gusä nägäst of Ethiopia from 1889 to his death. Menelik II was fascinated by modernity, and like Tewodros II before him, had a keen ambition to introduce Western technological and administrative advances into Ethiopia. Following the rush by the major powers to establish diplomatic relations following the Ethiopian victory at Adowa, more and more westerners began to travel to Ethiopia looking for trade, farming, hunting and mineral exploration concessions. Menelik II founded the first modern bank in Ethiopia, the Bank of Abyssinia, introduced the first modern postal system, signed the agreement and initiated work that established the Addis Ababa-Djibouti railway with the French, introduced electricity to Addis Ababa, as well as the telephone, telegraph, the motor car and modern plumbing. 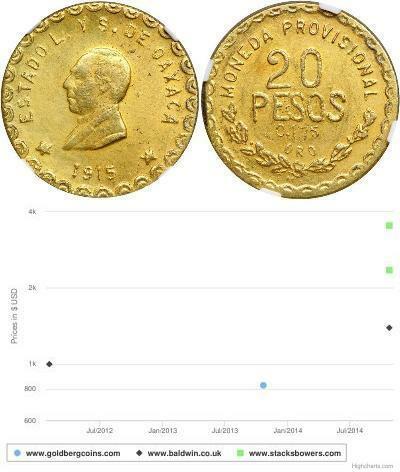 He attempted unsuccessfully to introduce coinage to replace the Maria Theresa thaler. During the 1890s, Menelik heard about the modern method of executing criminals using electric chairs, and he ordered 3 for his kingdom. When the chairs arrived, Menelik learnt they would not work, as Ethiopia did not yet have an electrical power industry. Rather than waste his investment, Menelik used one of the chairs as his throne, sending another to Lique Mequas Abate. During a particularly devastating famine caused by Rinderpest early in his reign, Menelik II personally went out with a hand-held hoe to furrow the fields to show that there was no shame in plowing fields by hand without oxen, something Ethiopian highlanders had been too proud to consider previously. He also forgave taxes during this particularly severe famine. Later in his reign, he established the first Cabinet of Ministers to help in the administration of the Empire, appointing trusted and widely respected nobles and retainers to the first Ministries. These ministers would remain in place long after his death, serving in their posts through the brief reign of Lij Iyasu and into the reign of Empress Zauditu. They played a key role in deposing Lij Iyasu.